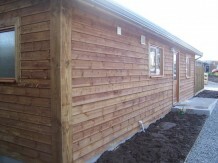 This building is known as our ‘Crinnis’ cabin. 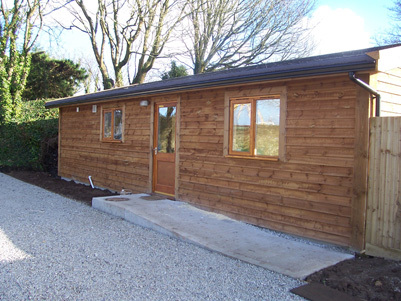 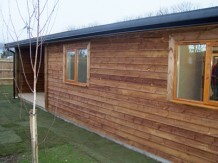 This particular cabin is the managers accommodation at the Animal Welfare Trust near Hayle, Cornwall. This is a timber frame building with feather edge timber cladding and a reinforced felt shingle roof. 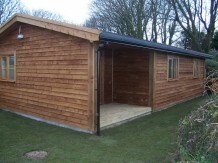 This type of building has an A frame roof construction and can be made to almost any size. 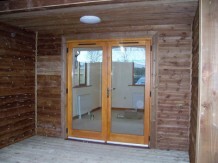 The internal ceiling is flat plaster board unlike many of our other cabins which are open to the apex.